← 437 "The Good, the Sad, and the Drugly"
The family competes in an Olympic swimming race to the couch, but Homer drowns not long in the race. "I will not put hot sauce in the CPR dummy." Principal Skinner: I paint houses. Father Knows Worst is the eighteenth episode of season 20. It originally aired on April 26, 2009. The episode was written by Rob LaZebnik and directed by Matthew Nastuk. "When Homer realizes that Bart's underachievements aren't going to be helped any by Lisa's unpopularity, he tries "helicopter parenting" – that is, he hovers over them constantly; meanwhile, Marge is too busy relaxing in the mysterious new basement sauna she just happened to find in the basement to care." While out at a carnival on the South-Side Sea Port, Homer accidentally swallows a flaming stick (thinking it was a kabob) and burns his tongue to the point which his old tastes buds have been destroyed revealing new sensitive tasebuds, making him a "super-taster". This makes the flavour of any food he eats magnify to such a degree that it becomes inedible, he is no longer able to eat anything with even the slightest bit of taste, leaving only cafeteria food Lisa brings home because it has absolutely no flavour whatsoever. He decides to come to Springfield Elementary to eat during lunch, embarrassing Bart in the process. He sits at a lunch table and meets a mother who's a "helicopter parent", who comes to school with her boy, Noah, and makes sure he does well. Homer observes how dumb Bart acts and how unpopular Lisa is and decides to help them out. He and Bart compete in the Plywood sculpture assignment, but the Washington Monument choice is too pathetic by Skinner's standards, so Homer goes for the hardest one of all, the "Westminster Abbey" model. He also helps Lisa get into the in-crowd with the help of a popularity book and a cellphone cover party. Homer sees that Bart will no doubt screw the project up and he offers to do it himself. He falls asleep and the ghosts that haunt the building advise him to let Bart do it, as he won't gain knowledge unless he does something. However, Homer moves in his sleep and demolishes his model. 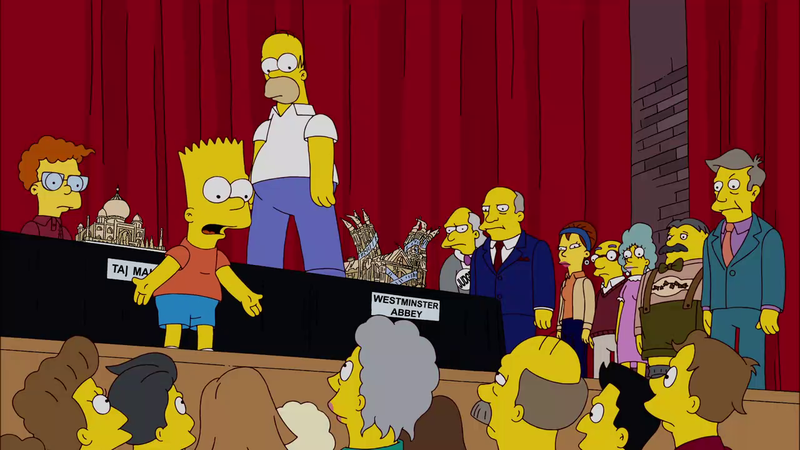 At the contest ceremony, Bart's model wins for looking like the only one who didn't have help from their parent Bart declines and reveals Homer did it and makes him stop messing with his life. Lisa tells him it also, as she doesn't like being cool. Meanwhile, Marge discovers a sauna in their basement and loves it, keeping it to herself. He becomes so relaxed that she is dazed when Homer tells her of the kids' problems. Later, after Homer fails as a parent, Marge reveals it to him and, unbeknownst to Homer, uses his beer to pour on the rocks. Modified on August 10, 2017, at 08:42.